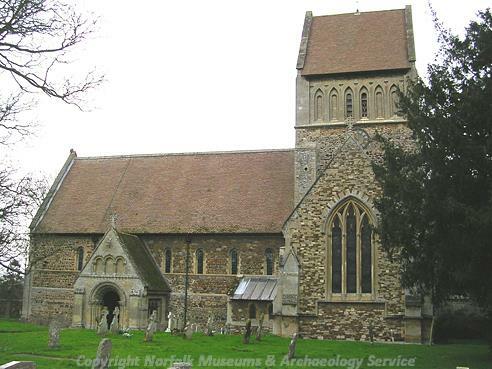 This is an excellent example of a Norman church. 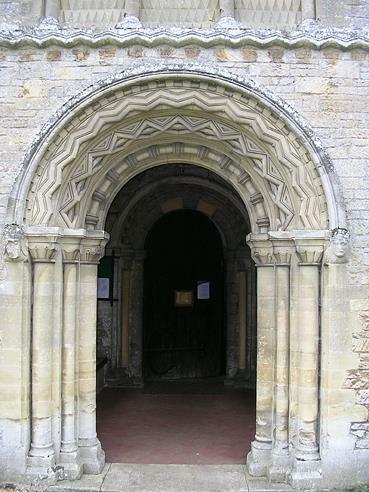 The building is basically Norman throughout, although it seems to have been constructed at two periods. It consisted of a nave, central tower and chancel. There was important remodelling of the church in the 13th century in Early English style, including the ornate east window in the chancel that still survives. There was also restoration of the church in the 19th century. Exceptionally important Norman parish church; 11th century font bought from older church (site NHER 3307). Norman work probably of two periods. Important Early English remodelling. Two major 19th century restorations. It is now believed parts of this church in fact predate the church in the castle which is seen as a chapel of ease. E. Rose (NLA), 17 December 1997. Observation by A. Rogerson (NLA) of trenches. E. Rose (NAU), 31 January 1990. 2011. The fabric includes large blocks of 'silver carr', the grey stone thought to have been quarried in the Castle Rising / North Wootton area and as used at Brancaster Roman fort, Reedham church etc. See NHER 56217. D. Gurney (HES), 27 April 2011. --- Aerial Photograph: TF 6642A/ABF. --- Article in serial: Cozens-Hardy B. 1934. Norfolk Crosses. Norfolk Archaeology. Vol XXV Pt II pp 297-336. --- Monograph: Bowman, H.. 1846. Specimens of Ancient Ecclesiastical Architecture, with Views, Plans, Details.. p 2. --- Publication: Clapham. 1934. Vol II, p 108. --- Monograph: Gurney, D.. 1997. Castle Rising Castle.. East Anglian Archaeology. Vol 81. --- Leaflet: 1975. Castle Rising Church. --- Monograph: Castle Rising History Group. 2010. The Ancient Borough of Castle Rising: from prehistory to the present day..
--- Monograph: Hart, S.. 2010. Medieval Church Window Tracery in England. p 38. --- Leaflet: Castle Rising Church. --- Archive: Clarke, R. R. and NCM Staff. 1933-1973. Norwich Castle Museum Record Card - Medieval. Castle Rising.